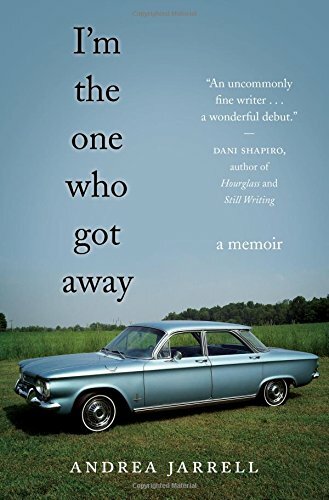 “I’m the One Who Got Away” by Andrea Jarrell is a beautiful narrative told in such a manner I often forgot that I was not reading a novel, but an extraordinary, captivating memoir. Escaping the throes of a violent, yet equally charming man, Andrea and her mother have a tight-knit relationship, often referred to by the author as, “just-we-two.” For the majority of her youth Andrea is minus the presence of a physical father, though her mother continually reveals to her stories of a larger-than-life father and his aspirations for fame and fortune. I was thoroughly charmed by this story. The author writes with such with eloquence and grace that the words just seem to flow and hours later, as I was turning the very last page, a sudden longing for more washed over me. Relatively short at just over 150 pages of text, I indeed felt a bit saddened when the journey was over. Jarrell remains respectful of her characters, protecting their identities while remaining true to herself. Though many of the difficulties experienced would yield a certain understanding if relayed with bitterness or a woe-is-me type attitude, it is refreshing that it never once feels like the author is whining or feeling sorry for the circumstances of her life. By no means a “happily-ever-after” story, the author inspires as she continues to learn and grow through the ever discerning lens of self-perception. And in spite of some of the trials Jarrell experiences throughout her life, the reader, at least this one, comes away from the story with a sense of fulfillment, and contentment one finds when things do indeed, end well. As an aside, I would love to learn more about the author’s mother – perhaps a sequel? I highly recommend “I’m the One Who Got Away” by Andrea Jarrell. Inspirational, captivating and genuine, issues such as single parenting, self-improvement, family values and personal growth, inner strength, there really is a message for just about anyone in this beautiful story. Fans of memoir and those inspired to tell their own story will appreciate the tone and reflection demonstrated through the author’s stunning voice.